The Chirurgeon’s Apprentice has a wonderful post on Georgian prostitution and syphilis, which inspired me to dig up my research notebooks and uncover what nineteenth-century aurists wrote about syphilis and deafness. Syphilis is a fascinating topic. In nineteenth-century London, people were quite aware of the gruesome and devastating aspects of the disease. The memoirs of Reverend Frederick Gilby (1865-1949), for instance, documented a “tragic case” of a poor deaf and dumb child at the Bow and Bromley Workhouse Infirmary who began to develop syphilitic symptoms. Aurists were aware that syphilitic invasions of the ear were not uncommon occurrences. Most of them agreed on the symptoms of syphilitic deafness, though they may have disagreed on the stages of the disease or which part(s) of the ear the disease was presented. Matthew Berkeley Hill (1834-1892), for instance, argued deafness in syphilis occurred at the late stages of the disease and presented in the tiny bones of the ear. By the 1870s, it was agreed that syphilitic deafness included symptoms of: damage to the eighth cranial nerve, tinnitus, a gradual loss of hearing, with periods of remission, and evidence of damage in the tympanic cavity. [T]he deafness which sometimes accompanies the secondary form of syphilis is generally believed to be caused by inflammation, and ulceration extending from the throat through the Eustachian trumpet [tube] into the middle ear. [He has] suffered for several months from sore throat, consequent upon an attack of secondary syphilis: for two months has complained of deafness in both ears, so as not to hear any except a loud voice. The deafness is accompanied by constant singing [tinnitus], which is increased when the head is on the pillow, and it varies much…The treatment pursued was the use of the nitrate of silver to the fauces, and the administration of steel wine. On July 2d he told me that three or four days previously he heard quite well in the morning, and the improvement lasted for two days, since which he has been gradually getting deaf again. By perseverance in the treatment for a month he perfectly recovered. 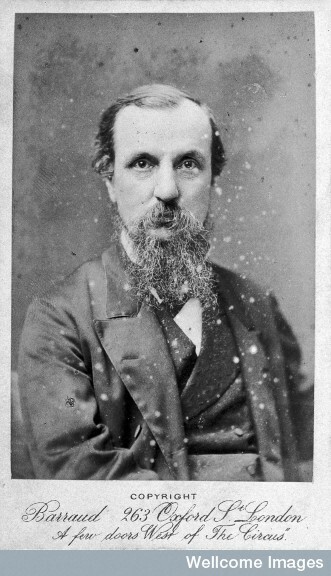 James Hinton (1822-1875), aural surgeon at Guy’s Hospital, also noted that 1 in 20 of his patients manifested symptoms of syphilitic deafness. Hinton also assisted in the research of English surgeon Jonathan Hutchinson (1828-1913), who was collecting data on inherited syphilis. Hutchinson studied at St. Bartholomew’s Hospital and was a member and fellow of the Royal College of Surgeons; his remarkable surgical career led to appointments in several of London’s hospitals, including the Lock Hospital, the London Hospital, and Blackfriars Hospital for Diseases of the Skin. 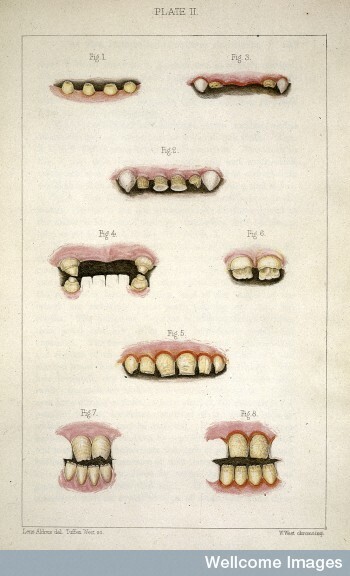 His work on syphilis was the first to connect various symptoms to form diagnosis—what’s now called the Hutchinson Triad, in which symptoms of notched teeth, interstitial keratitis, and deafness, could provide a firm diagnosis of congenital syphilis. 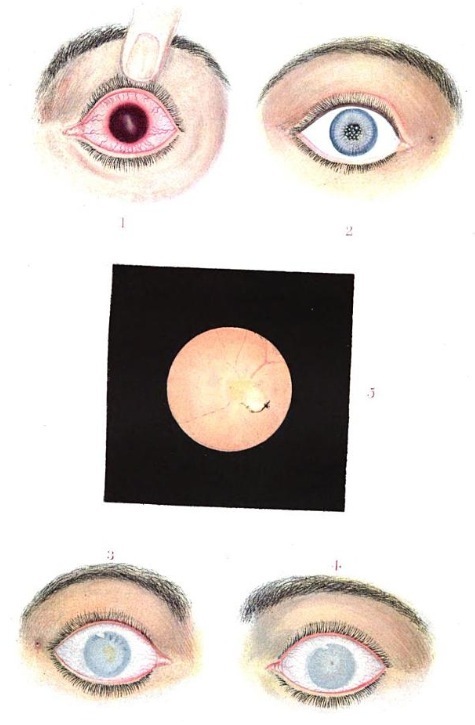 In A Clinical Memoir of Certain Diseases of the Eye and Ear as a Consequent of Inherited Syphilis (1863), Hutchinson states that deafness frequently follows the presence of keratitis and in the majority of cases, the deafness was complete and permanent. He found syphilitic deafness occurred in cases of diseases of the cranial bones extending towards the internal and middle ears; of these cases, otorrhoea (inflammation of the ear with excessive discharge) was an invariable symptom. Deafness in greater or less degree is frequent in the subjects of inherited syphilis. In some instances it advances to the almost total abolition of the perception of sound. These extreme cases are however exceptional, and more commonly only the hearing is only partially lost. Symptoms of syphilitic deafness were indicative of the progressive nature of the disease. As Hutchinson explained, deafness is usually symmetrical, in that it appears in both ears at the same time. In none of his cases did he find any changes in the tympanic membrane (eardrum), although the membrane was often abnormal in some way. The stages of hearing loss are rapidly passed through; a patient’s hearing could drastically diminish in six months from perfect hearing, to totally deaf, without any marked degree of pain. In cases of inherited syphilitic deafness, Hutchinson observed that deafness usually appears in five years either before or after puberty. Matthew Berkeley Hill, Syphilis and Local Contagious Disorders (1868). Deborah Hayden, Pox: Genius, Madness, and the Mysteries of Syphilis (2003), p.80. William Wilde, Practical Observations on Aural Surgery (1853), p.252. Joseph Toynbee, The Diseases of the Ear: Their Nature, Diagnosis, and Treatment (1860), p.235. Jonathan Hutchinson, A Clinical Memoir of Certain Diseases of the Eye and Ear as a Consequent of Inherited Syphilis (London: 1863), p.174.